Are you looking for a gift or award for someone in the Fire Service Community? We manufacture unique personalized, handcrafted wood gift awards to show your appreciation to a Firefighter for their dedication and service to your Fire Department and Community. We offer firefighter plaques and awards for Christmas gifts, Retirement, Recognition, Memorial Axes and Axe Plaques, Maltese Cross Badge Plaques and Clocks, Signs and Fire Truck Plaques Signs, Rocking Chairs, Picture Frames, Toy Boxes and Storage Chests and Trunks; all with a Firefighter Theme. If you are looking for plaques for a retired firefighter, firefighter plaques and/or awards for active firefighters, or possibly that special Christmas gift for that special firefighter, you have come to the right place. 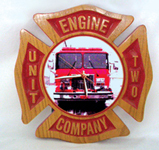 All our firefighter products are made of solid oak, pine or redwood. We buy our woods from a local family owned wood mill. Our axe heads for our firefighter axe plaques are solid bronze and cast at a local Ohio foundry. All products are hand-crafted and have a lacquer finish. Redwood products are suitable for outdoor use. Our firefighter products are proudly made in the United States of America. We guarantee you will be pleased with all our firefighter products. Please remember, as with all wood products, each piece is a unique creation with naturally occurring variances within the wood grain. We consider this to be a part of the beauty of each individually hand-crafted piece of woodwork.